Herbaceous aromas lead into a light-bodied palate marked by mild pear sweetness, finishing light and crisp with hints of fresh-snipped herbs and cinnamon. Versatile; sip or mix. Best Buy. 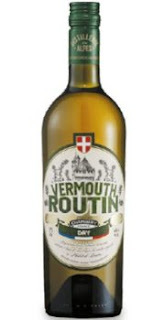 TASTING NOTES: Vermouth Routin Dry is made from 17 plants, flowers and spices and a subtle blend of French white wine of Sauvignon grape and regional wine of vineyard Jacquère. Its unique bouquet, its subtle dry taste, and its slightly golden color, give it its distinctive character. Rose petals, juniper, rosemary, wormwood, and bitter almond are the priciple flavor components, besides fine French wine, of course! Aromas of pineapple and tropical fruit are accented by a hint of vanilla. The bone-dry palate opens with tart green apple, though any hint of fruit sweetness disappears in a flash, winding up crisp and bracing overall. Martini material. Best Buy. Vermouth Routin Blanc is made in Chambéry, from French white wine of Sauvignon grape variety, regional wine of vineyard Jacquère, and a skilful blend of 18 plants, flowers and spices. Its refined bouquet is characterized by aromatic thyme notes, as well as light spicy notes. Its very sweet taste, as well as its pale yellow color, give it its distinctive character. This was the distillery’s first product, invented by the founder, Philibert Routin. Made with 24 plants and spices, this vermouth is made with Cabernet Sauvignon and Jacquere, then aged in oak barrels to add complexity and depth of flavor.